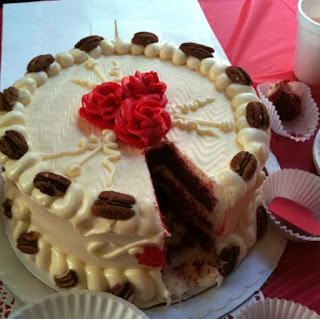 A Cake Bakes in Brooklyn: Breaking News! Marty Markowitz liked my cake best! Breaking News! 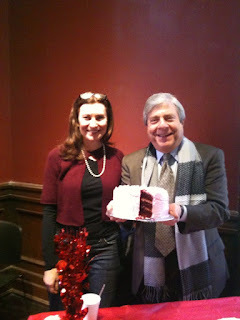 Marty Markowitz liked my cake best! 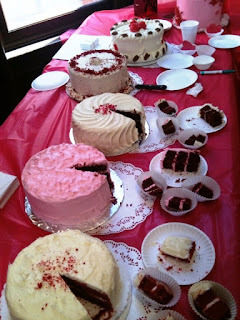 I just returned from The Red Show's "Best Red Velvet Cake in Brooklyn" contest. When I arrived at the Brooklyn Historical Society and saw all the beyond GORGEOUS cakes (my iPhone photos do not do them justice), I was mortified. Really, I wanted to drop off my cake and and sneak away. But after several encouraging emails from DH (that's dear husband), I decided to stick it out. 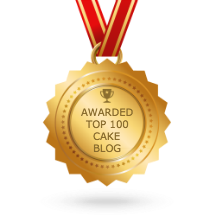 After preliminary judging, my cake was in the top three! While I did not win best overall (that went to the beautiful cake with the raspberries and iron heart on top), I was singled out by Marty Markowitz, Brooklyn borough president, who was one of three judges. "Who made this cake?" he asked, pointing to mine. The organizer announced my name, and when I approached the table Marty told me that he liked mine the best, but decided to defer to the other judges. 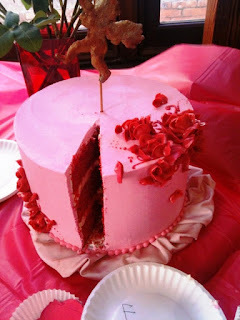 (He whispered that I would have won had I not tinted the frosting pink.) Whatever. In my mind I did win! I encourage everyone to visit The Red Show at the Brooklyn Historical Society today and tomorrow. There won't be any cake, but the first floor is filled with craft vendors and is a perfect place to buy that special someone a Valentine's Day gift. Congratulations! Looks sooooo good. Isn't Marty Markowitz that guy who told everyone in Brooklyn to go on a diet? I don't know why I remember that - his catchy name, maybe. Looks like he's back to eating cake whever he wants to! I can't believe I missed this event! 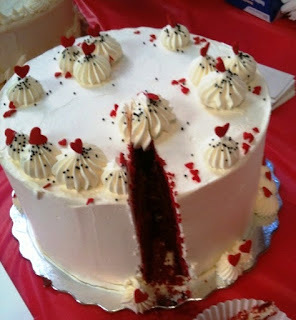 I love red velvet cake something fierce :( Where did you hear about it? Congrats on the cake!! For me taste always wins out over presentation, so phewy to the pink frosting comment! @Lucy: Thanks so much! I heard about the contest from a friend of a friend. The event, mainly a crafts fair, wasn't that well publicized (or else it was, but because there's always so much going on in NYC even good events tend to get lost in the sauce). 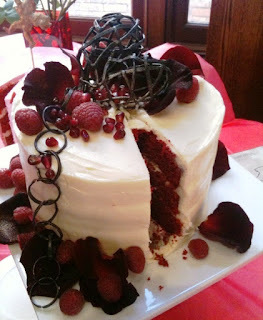 The best red velvet cake recipe I've found and the one I base mine on is by Cake Man Raven, and is published on Arthur Schwartz's website, Foodmaven.com. Delicious and easy (and addicting). Happy baking!